Employment training centre on South End. The premises were once occupied by a shop called The Concept House photo, but as of July 2013 they were vacant with a "to let" sign. 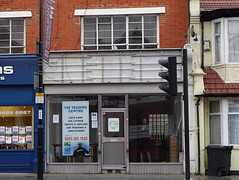 Signage for a tanning salon called Tanworld was up by October 2013, and it opened some time between then and March 2014 photo. By April 2015 Tanworld had gone and there was signage up for an organisation called Get Me To Work photo. This was open by December 2015 photo. Get Me To Work was a social enterprise company focused on coaching and mentoring unemployed people to help them back into work. Some time between March 2017 and February 2019 it became something called The Training Centre. Last edited 2019-03-09 13:17:00 (version 29; diff). List all versions. Page last edited 2019-03-09 13:17:00 (version 29).